Larkspur ‘Cannes’ series. Click image for larger view. Larkspur is an annual grown from seed. Seeds require low temperatures for germination and growth, and do not germinate well above 65 F.
Growers typically refrigerate the seed for 2 weeks before sowing, or if transplanting, may place the seedbox in a cold room at 40 to 50F for two weeks after sowing. Seeds may be sown in fall in high tunnel, and survive winter in seedling state. 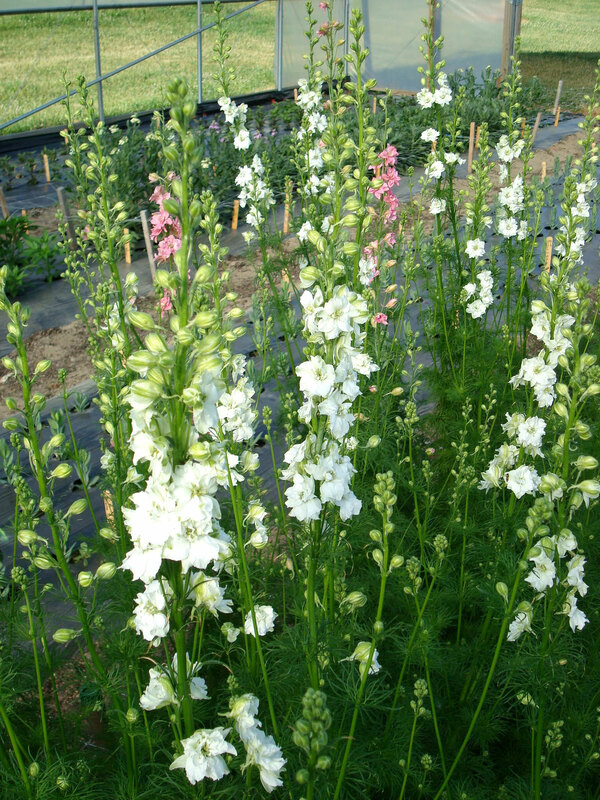 Sowing in late Feb. to mid-March in the greenhouse after seed is cold-treated and transplanting to the tunnel in early to mid-April resulted in flowering mid-June in Ithaca. Cool spring tunnel conditions can satisfy cold temperatures needed for flowering. But late spring tunnel planting may result in poor quality flowers and short stems. When direct-seeded, space seeds 1 in. apart in the row, rows 12 to 24 in. apart. Space transplants in beds at 4 x 4 in. to 6 x 6 in. Larkspur is susceptible to root rot. Planting in raised beds reduces this risk by improving drainage. Flowers are sensitive to ethylene, and lose petals (shatter) quickly if stored with fruits that give off that ethylene gas. Vase life at room temperature: 5 to 7 days. Keep flowers cool until used. Flowers retain color after drying and are often used in dry bouquets. For more information, see: Armitage, A.M. and J.M. Laushman. 2003. Specialty Cut Flowers, 2nd Edition. Timber Press, 586 pp. Available through ASCFG.